This is probably my most repeated dinner. Moe had actually been asking for a Roast Chicken dinner since about two days after our Christmas turkey dinner. I finally caved. Should have made it sooner. I really could eat this meal once every 10 days. How boring is that????? braised cabbage and fresh steamed green beans. The cabbage was delicious. Very easy to prepare. Cut three or four slices of bacon into one inch pieces and fry until crisp. 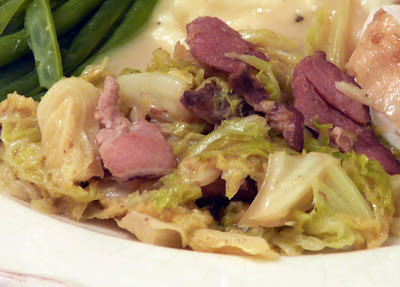 Coarsely chop the Savoy cabbage and toss quickly in the bacon fat. Add one or two cloves of cracked garlic, salt , pepper and a little chicken broth. Cover and simmer until tender. Savoy Cabbage cooks quickly. Thank you to Michael for hosting Foodie Friday. Go to Designs by Gollum to visit the websites of other participants. That plate looks like perfection to me! I could eat it every 10 days as well! Meee, too. I could stand in line for this. I could eat roast chicken once a week! A very versatile dinner! 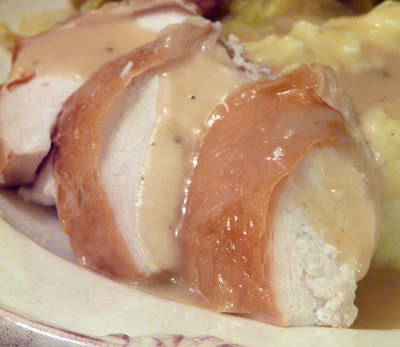 Love your pictures -- want to go pluck a piece of chicken out of them! And I do my cabbage the same way only without the garlic -- will have to try that next time. I must say we get variety from a roast chicken because the vegetables are different every time we eat it. We get organic chickens here that are THE BEST! ohh that chicken looks absolutely amazing! your pics are stunning . Your chicken looks so delicious. We are not much on eating cabbage, but it's mainly because I don't know about how to prepare it other than for cole slaw. I will try this for sure. What's there not to like about bacon in anything? Come back and see me sometime. Your chicken dinners always look so delicious! What a perfect plate. This really looks delicious. Have a wonderful day and enjoy Foodie Friday. That looks like pure comfort food. 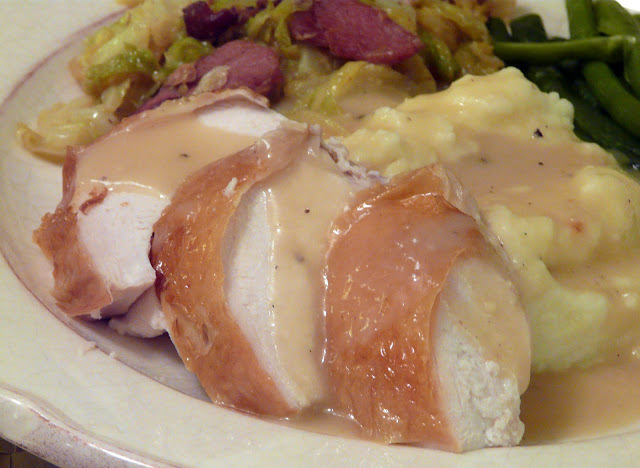 I could eat chicken with mashed potatoes & gravy every 10 days, too. Thank you for the Post on my site. All of the food on yours looks AWESOME! I reiceved the soup bowls as a birthday gift, but I beleive they are from Ross.